IT'S S.A.F.E. WEEK! Stuffed Animals For Emergencies donations of gently used stuffed animals & books will be given to Michigan children in crisis. Donations can be left in the front lobby April 15th-19th. GET YOUR RUNNING WITH THE WOLVES T-SHIRT! T-shirts are available online until 11:59pm, April 18th. Each grade level wears a specific color. T-shirt sales help support the fundraiser event, so click now to put in your order! M-STEP TESTING FOR GRADES 3-5 BEGINS after spring break. Parents, please make sure your child is ready for testing. Click for testing dates and what your child needs to be ready. NEXT ALL PRO DADS is April 18 - Dads (or Moms) and their Wass kids team up monthly for a quick, fun breakfast. It's an opportunity to get some tips to be the best parent you can be, and strengthen your relationship with your kids too! Click to RSVP. 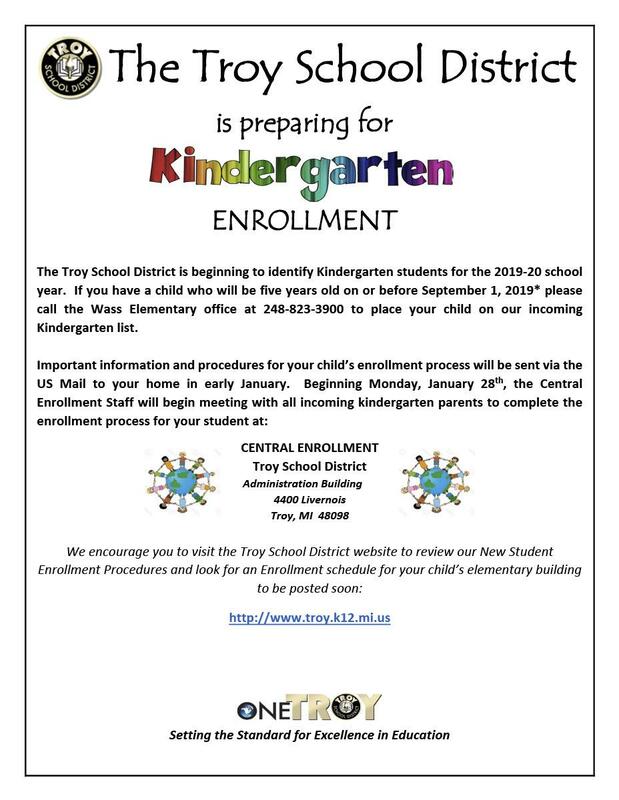 2019-2020 KINDERGARTEN ENROLLMENT IS OPEN. If you have a child who will be five years old on or before Sept. 1st, call the Wass office at 248-823-3900 to place your child on our kindergarten list, and to receive additional information. MY AMERICAN FLAG IS OLD AND WORN, WHAT SHOULD I DO? Click to learn about the "American Flag Disposal Project" and how to be respectful of our flag. APRIL 11th is RESTAURANT NIGHT! Eat at Noodles, 6836 Rochester Rd., between 4pm and 9pm and 50% of sales will go to Wass PTO so they can do more for Wass students! Mention Wass or show the attached flyer when you order.